To say that alot has been happening with Ursa’s Den in the last few months is a major understatement. Seriously. Not only have we been taking on and completing a number of awesome contracts for clients all over the globe, but Bryan took on some new writing gigs with the people at Dark Age ( www.dark-age.com ) … a VERY cool game that we hope will only get cooler with the stylings of Mister Steele to add to it! It was because of the blossoming relationship with Dark Age that Bryan did a co-hosting of one of our favorite podcasts: www.garagehammer.net , specifically focused on Dark Age. It is always a good time to do interviews and talk shop, but this podcast did something else altogether… it got the attention of a new company interested in Bryan’s talents. The people of Dark Age actually work under the massive umbrella of the famed company, Cool Mini or Not ( www.coolminiornot.com), and when the owner of that company heard the podcast…he dropped us an email and inquired about Bryan possibly doing more work for CMoN. There was some back and forth, but in the end Bryan was brought on part-time (so no worries for all of our contract clients…we still do our normal writing/design/miniature work, too!) as a Game Industry Marketing Exec. What this means in the future, who knows? But as of right now, Bryan is a very happy game industry professional and is lookng forward to bright, cool new things on the horizon! It has been a crazy last quarter of 2011, but I have been a very busy little guy. I just wanted to point everyone toward the Testimonial tab on my webpage…it shows how much my clients have enjoyed my services! In fact, anyone who commissions me to paint any of the following in the months of May and June (for when they come out in June, of course)…get 10% off their order out of how freakin’ AWESOME they are!!!! Seriously…go see these bad boys for yourselves and decide to start a beautiful Dark Eldar force!!! Hey folks, I just wanted to give everybody an update as to what I am working on at the moment that is keeping me so crazy busy. Let’s see…I am working steadily on a huge (and excellent!) Dark Eldar painting commission that will really turn out to be a sharp looking force when it is all said and done. Seeing how cool these models are and honestly how easily they paint, it almost makes me want a Dark Eldar force of my own…(No worries…I said ALMOST!). I have a very loyal and excellent client that has me painting his Thousand Sons at the moment, too. These guys are a cool force that he has put a lot of conversion work into them and a decent portion of Forgeworld support…including the 1k Sons Dreadnought! I’ll be sure to get some pics up of this bad boy when it is done. Speaking of Thousand Sons and Tzeentch in general, I’m also working up an Apocalypse-scale Silver Tower of Tzeentch to put onto eBay. It is built and basecoated, but the additional details have had to take a back seat to commissioned work. Be prepared for the linkage when I get it up, though. I just put the finishing touches on a pair of Blood Bowl trophies for a new client (hopefully one with some repeat business…this was fun! ), too. These aren’t the first topic-specific trophies I’ve done, as I did some 40k trophies for a tournament a while back. They were fun to build and low-stress to paint, so I want anyone else out there who wants to jazz up their prize support to drop me an email! Pictures to follow in the next few days or so. Also, due to the excellent commercial advertising I am getting over at www.garagehammer.net , I just got signed on to do a VERY cool Khorne Warshrine and Daemon Prince conversion set based on the Ogre Kingdoms models. This guy has some very keen ideas as to what his Chaos Warriors army is going to look like, and I am extremely happy to be part of making it happen for him. Anyway, that’s what is on the plate at the moment…so while I might be pretty busy, feel free to drop me a line on anything you want to talk about and we will fit you into the queue somewhere! Winter is over, hibernation is done and the Ursa’s Den is ready for anything! Merry Christmas and Bring the Pain! Hey Ursa’s fans…I know everyone is neck deep in holiday cheer and stuff, but I wanted to let everyone know that I have been CRAZY busy in these last few weeks on commission work (including several raw sculpting projects! More on that in the new Sculpting tab at the top of the page…go ahead…click it… you know you want to! )…but that doesn’t mean I have been leaving my non-commissioned work by the wayside. 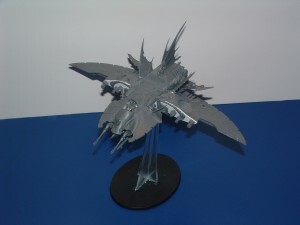 THE DARK ELDAR RAZORWING JETFIGHTER! This was a lot of fun to make, and I hope to see many of them winging their way across the Webway and onto tabletops all over the world soon enough! If you want one of these bad boys…or the slightly larger and altered Voidraven bomber kitbash (coming soonish)…drop me a line and we’ll work something out! Otherwise…have a happy and safe holiday and stick around the Ursa’s Den for more cool stuff in 2011!!! Just in time for the holidays…gift certificates are now available!! Give the gift of gaming to your friends and family…especially those that you know have stuff that the folks at Ursa’s can do!!! October Special – Time For Halloween! Halloween! Hey everyone! Bryan here, and Ursa’s Den has another miniature special going on this month…just in time for Halloween! Here’s the deal…if you want 10% your order, it’s time for something Halloween-flavoured! Vampires? Ghouls? Zombies? All of these things would qualify! And yes…I suppose Candy Corn, too…however that might come up. So…grab your spookiest Halloween miniature and get a good paint job for a lower price! With Autumn Coming…the September Specials! Hey Ursa followers! Well, it is September, the leaves are getting ready to change colour and I am looking to celebrate the cooling of the thrice-damned temperatures with a new combination of shades for my monthly 10% off special. Any painting order agreed upon in the month of September whose primary colour choice is BLACK and the off-tones/contrast is either ORANGE or YELLOW will receive the 10% discount. As a special-within-the-special, any creatures made of/that are animated TREES (GW Wood Elf Dryads, Treekin, Treemen, etc.) that are to be painted in autumn tones will earn 15% off instead! And the final (I mean it!) September special…to celebrate the start of the American Football season (of which my wife/business manager is a big fan), anything from the BLOOD BOWL miniature line is also 15% off! Cheers, and have a happy autumnal start! Hey all…it has been a busy few weeks around here and now I have a chance to drop everyone a note! I’m back from a prolific and enjoyable GenCon Indy, and I can say that Ursa’s Den did very well all around. Not only were a lot of babies kissed and hands shaken, but some work was mentioned and pre-arranged while business cards were strewn about dealers and consumers alike. 2011 is going to be a banner year, I believe. Anyway, on to what you all actually want to hear…the August Special! To celebrate the amazing and awesome 8th Edition of Warhammer Fantasy…I am using August’s Special Discount to cover ANY fantasy characters! From champions tucked away in units to lords astride giant dragons…they all get the August Special discount of 15% off! So there you go…now is your chance…Warhammer Fantasy go!!! !